The taxi journey from Beijing Airport to Happy Valley took the better part of an hour, but despite the time involved the overall fare was the equivalent of just over ten euro. Perhaps the Chinese authorities deliberately subsidise taxi fares in order to compensate for the near-death experience enjoyed by all passengers; whatever the case, it was a relief to step out onto the footpath at my destination. The process of purchasing a ticket and entering the park was relatively painless, though it was slowed somewhat by two students in front of me looking for discounted tickets (only available to the locals). For whatever reason it was necessary to peruse their ID booklets in detail, and the same process was repeated by no fewer than four staff members; the ticket sales lady, a security guard, and two different staff at the turnstiles. The new attraction this year is Extreme Rusher (#1617), a launched coaster from S&S, and it's a winner. 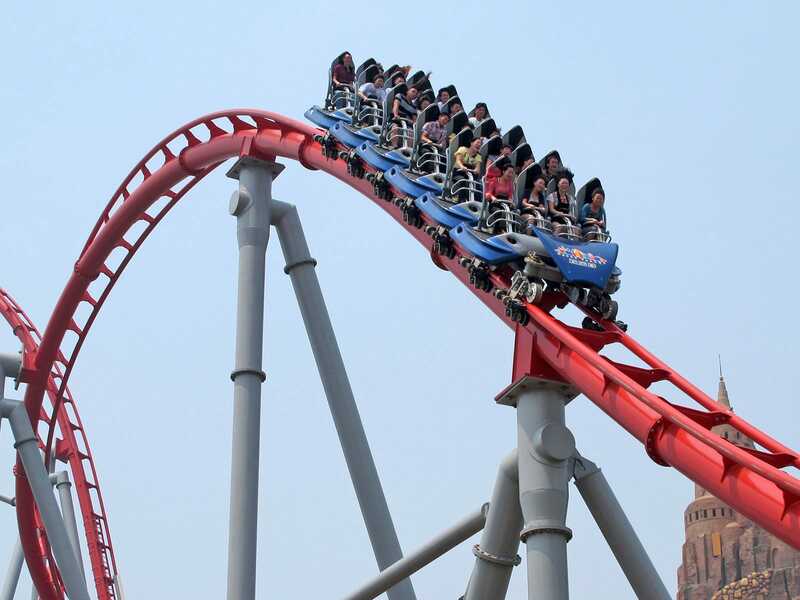 The ride begins with a surprisingly fast drop out of the station leading to a launch track, where a catch mechanism driven by compressed air is used to accelerate the train to its top speed. From there riders are taken through some wickedly intense moments, one particular highlight being a sharp directional change just before the brake run that manages to provide airtime and lateral forces simultaneously. The train introduces a new lapbar design which is very comfortable without being oppressive; there are ankle guards but for me at least they didn't restrict my movement at all. The track quality is pretty smooth too, with only an occasional amount of jarring. The only difficulty I have with the ride was the way it was operated today. The park was open today for thirteen hours beginning first thing in the morning, so why on earth was their new signature coaster open for less than half that window? I've never been a fan of staggered openings at the best of times, but operating a brand new attraction for a few hours of the day only is simply unacceptable. There was an three quarter hour long queue for the ride at closing time, as there had been for several hours, indicating that many more people would have ridden if given the chance. It was while queueing for this ride that I was treated to some light entertainment; a young lady started yelling for her friends who were sitting some distance away. Getting no response, she persuaded a security guard to lend his megaphone, which still garnered no response despite excited jabbering in high velocity Chinese. She never did manage to make contact, though her antics amused everyone else within earshot. On an unrelated note, it was surprising to see the park selling fully loaded water pistols, of the super-soaker variety. I wondered for a while whether I might be able to use one to short-circuit the speaker system in the Harvest Time (#1618) queue line; the ninety minute wait (for a Golden Horse spinner, yes, I know) was punctuated every few moments by a repetition of the ride rules at a volume on the very edge of the pain threshold. With the new coaster this year it was perhaps no surprise to discover the magnificent Crystal Wings was a walk-on. More by luck than judgement I found myself in the back row, remembering just a little too late how intense the pretzel loop is from that seat. This marked my last coaster of the day; I spent the remainder of my visit taking photographs.